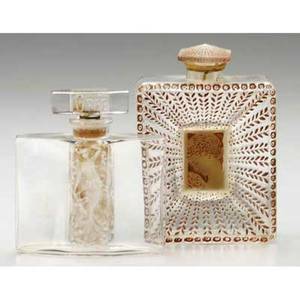 R. LALIQUE Two perfume bottles of clear and frosted glass with sepia patina, "Danae" for Magasin du Louvre, Paris, c. 1930, and "La Belle Saison" for Houbigant, c. 1925. Molded marks. M p. 941 and 944, No. 1. 3 1/4" and 3 3/4"